I had an original model GBA, and GBA Sp models 1 and 2. I miss reflective TFT screens. The sun shines bright here, so backlit / LED screens seem like such a waste, trying to out-shine the sun to make your screen visible. Reflective TFT worked with the sunlight to show you a brilliant image without using extra battery power. 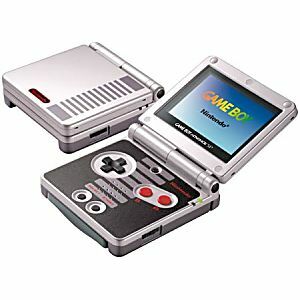 I had the GBA Advance, the same model as in the picture! I really enjoyed it, it travelled really well. I enjoyed playing Mario Kart Super Circuit and Fire Pro Wrestling mainly. I had a Game Boy Advance and I believe mine looked exactly like that picture. I remember it being that clear color. I had it when I was really young so I do not remember that much about it. But, I do remember taking it everywhere with me. I remember playing a lot of The PowerPuff Girls: Him and Seek. I loved that game because I loved The Powerpuff Girls show as a kid! I also played Pokemon: Fire Red as well because I always loved the Pokemon games! I always saw the DS as Nintendo’s best handheld, but the more I think about it the more I think the GBA is the one that deserves that title. It had a spectacular library, including a bunch of excellent Mario, Metroid, and Zelda titles (an area where I think the DS is a bit lackluster). The Gameboy Advance was one of the first systems I bought at launch. Got that blue one in the picture along with Tony Hawk 2. Didn’t really play much of the console’s library, but I became obsessive about the games on the GBA that really connected with me. I am a massive Fire Emblem fan and I’ve owned and beaten every entry in the series multiple times. I dearly miss Advance Wars. And Wario Ware made its debut on the GBA and it’s still one of the quirkiest and coolest games out there. I traded the blue GBA for an SP. Then traded that SP for the special edition SP that is styled like the NES. Still have it and I’m pretty sure it still works. The GameBoy Advance was the very first handheld that was mine and what made it even more special to me was it was the first hardware I bought with my own money my senior year in high school.